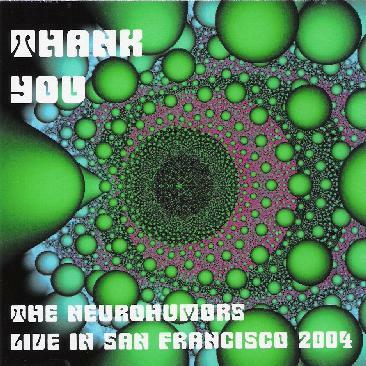 The Neurohumors - "Live In San Francisco 2004"
Imagine if the Grateful Dead had come from Germany. Recast that classic Marin County acid rock jam sound in a Krautrock light, with liquid synths and ambient textures, and you'll start to get an idea of what The Neurohumors sound like. Lead by drummer and keyboardist David Jayne (not entirely sure how he plays those two together live!) the Neurohumors excel at creating long, spacey, totally improvised instrumental jams. Like the Dead were in their heyday, this band is both tight and loose at the same time. They're tight in the sense that these are very talented musicians who play well together, so well in fact, that there's a nice loose comfort to their sound. They have the kind of telepathic connection the best improvisational musicians have with each other that allows them to go with the flow, playing off each other, working up deeply intriguing rhythms, lush and dreamy atmospheres, and on the spot melodies that sound as if they were composed and planned out ahead of time, even though they weren't. Guitarist Lance Case's style even bears an uncanny resemblance to the late Jerry Garcia's, adding to that distinctive Marin County flavour, along with a jazzy rhythm section and some great piano playing. But then the liquid synths flow in as well, taking it all into outer space. Some of the tracks like the 20-minute Rise of the Phoenix and the 25-minute Instead of Janet are long explorations that evolve through various styles from ambient spacescapes to down and dirty funky jams, while other shorter pieces, like the lovely, exotic Jungle Jam focus on playing around one specific mood, but it all gives the album a great deal of variety. The quality of the live recording is excellent, capturing all the dynamics of the sound, making this a great album to just kick back with a pair of headphones on and get lost in. While the band supposedly has a web site here: http://www.neurohumors.com, it seemed to be down whenever I checked it. But David Jayne can also be contacted by e-mail at: davidjayne@earthlink.net.